The elders had poured libations, the holy men had delivered invocations, and all had sworn allegiance to the Ashanti kingdom. A battery of percussionists, glistening with sweat, started pounding out waves of rhythm that brought hundreds of guests, draped in elaborate kente cloth, to their feet. A scrum of men formed at one end of the hall and hoisted to their shoulders a wooden litter. It bore the newly inaugurated chief, wearing gold jewelry and a gold-studded leather crown, who bobbed above the celebrants and flicked a horsetail whisk and a golden scarf in a studied regality. And so, just before dawn the last Sunday in May, one of the most elaborate rituals in immigrant New York reached its apogee. The man at the center was Nana Acheampong-Tieku of the Bronx, New York regional chief of the Ashanti people from Ghana in West Africa. Nominated by a 10-member council of regional Ashanti elders, and voted on by community members, the regional chief has a range of ceremonial and practical duties. He mediates familial and business disputes, including fractured marriages, before they reach the courts. 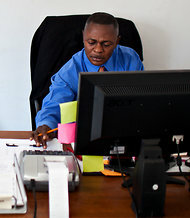 He helps Ghanaian immigrants find employment, lodging, medical care and legal help. He also leads a fund-raising effort for scholarships and for a children’s hospital in Ghana among New York’s growing Ghanaian population, the largest African immigrant group in the city, which numbers more than 22,000, up from about 14,900 in 2000, according to the Census Bureau. Mr. Acheampong-Tieku’s most pressing challenge, however, is the survival of his very organization. He serves under the aegis of the Asanteman Association of U.S.A., an Ashanti cultural group formed in 1982. But even as the population of Ghanaians and their subgroups has grown in the New York region, the association’s membership has plummeted. It has about 70 dues-paying members, down from about 1,000 in the 1990s. Many of the association’s original members, most of them immigrants, have moved back to Ghana or died, but they have not been replaced by their assimilated, American-born offspring or newly arrived Ghanaians. This is a pattern familiar to many immigrant diasporas: Organizations formed by early waves of immigrants struggle to remain relevant as the needs and desires of later generations and more recent newcomers shift. Nana Kofi Appiah, 74, who helped create the organization, said none of his five children living in the United States were interested in taking part. Mr. Acheampong-Tieku, 52, has felt this tension in his own home. He has four children, but only one — Vera, 20 — has decided to participate in the association’s activities, and only after being lobbied by Mr. Ampah Sahara. At 34, Mr. Ampah Sahara is one of the youngest members of the group and is trying to use his relative youth to attract young Ghanaians and Ghanaian-Americans to the organization. Low membership, in fact, almost scuttled the ceremony. Mr. Acheampong-Tieku was elected chief in December 2010 and, according to tradition, he should have been sworn in within six months. But the association had little money, and the budget for the two-day ceremony was about $25,000, including airfare and accommodations for a high-ranking chief from Ghana and his entourage. It took more than a year for Mr. Acheampong-Tieku, as the chief designated by the association, to raise enough money. He was soft-spoken, and wore an awkwardly matched navy pinstripe suit jacket and brown slacks. He bore little resemblance to the glorious figure feted two days later. “What we want is unity, to bring ourselves together and help the needy people,” he said. 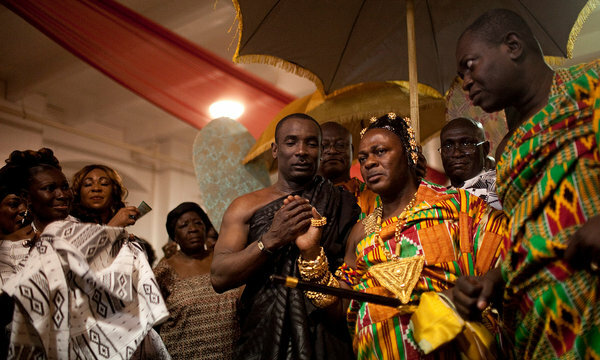 Throughout the week, chiefs and prominent Ashantis from around the United States and abroad arrived in New York, including Nana Adusei Atwenewa Ampem I, an Ashanti chief and foreign minister of the court of Otumfuo Nana Osei Tutu II, king of the Ashanti empire, based in Kumasi, Ghana. Mr. Atwenewa Ampem stayed at a Marriott Hotel in Yonkers, where he received a stream of acolytes and Ashanti royalty. “Why are we here?” Mr. Atwenewa Ampem asked rhetorically in an interview in a third-floor suite. He wore an elegant white robe and sipped Hennessey. The event consists of two consecutive nights of ceremony; the first is the inauguration, and the second celebrates the first. On a Saturday late last month, the day of his inauguration, Mr. Acheampong-Tieku spent the day racing around the Bronx, greeting tribal elders and briefing them on the ceremony and news from the local Ashanti population. The inaugural ceremony was held in an all-purpose room at a Roman Catholic church in the Tremont section of the Bronx. Chiffon bunting in the colors of the Ghanaian flag — green, yellow, red and black — hung from the ceiling. Hundreds of folding chairs arrayed in long rows on each side of the room formed a wide alley down the middle. At the far end was a wooden thronelike seat for the king’s delegate. Guests began arriving after 10 p.m. — taxi drivers, bankers, teachers, business administrators, entrepreneurs and laborers. The men were draped loosely in kente cloth, the women wrapped in gowns and topped by ornate hair styles and elaborately fashioned head scarves. And the event had only just begun. There were several more hours of music and dance, ritual and ceremony until 4:30 a.m. The second-night party was yet to come, but the Ashanti population of New York had a new chief. Copyright 2012 The New York Times Company. Reprinted from The New York Times, New York Region, of Monday, June 4, 2012.